Noah Fuller (Fuller Watch Company) has issued a new watch. It is the XW-DMC-12 DeLorean Tribute watch. The watch design was inspired by the DMC-12 DeLorean. As you know, the DMC-12 was the 'Back To The Future' car. The watch is design around the Seiko SKX007 watch. That means it has a solid base watch with a reliable and robust movement in the Seiko 7S26 calibre. The watch is completely sterile and is rendered in black and silver. 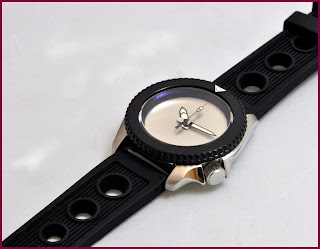 The PVD black bezel and insert, which is unmarked except for the marker at 12 o'clock was designed to look like a car tyre. The watch will feature a sapphire crystal (an improvement over the original) and the Seiko Sumo Black Hands. The dial is silver and is sterile, without even the hour index markers. It reminds me of the Movado Museum watches, which is also sterile (OK it has a moon as a marker at 12 o'clock). The double thick case back is also sterile. I am sure the watch is rated to 20 ATM. It will come with a Tropic Race strap, which I can say is very comfortable.